Troon North Golf Club’s Monument Course in Scottsdale, AZ is well deserving of its spot at #45 on Golf Digest’s 2010 Top Courses You Can Play list. Due to budgetary reasons, I booked this tee time for the middle of August, during the hottest time of the year in one of the hottest deserts on the planet. Still, even though the sweating started before the clubs were on the cart I enjoyed every second on this course. The practice areas were top tier; the putting green rolled so smooth I came away thinking it would be an easy day after draining a few 20-footers. I came prepared. A solid pre-round meal, plenty of SPF-50, new Adidas clima-cool shirt, comfy Dri-Fit socks and over 120 fluid ounces of Gatorade and water meant the heat would not be as daunting as the triple-digits appeared. Then I teed off. My first shot hooked right into some cactus (a recurring theme during this round) and I put another into the fairway to open up with a triple-bogey 7. It began a day when my course management was poor at best. I was given every tool to play the course smart and ignored them all. 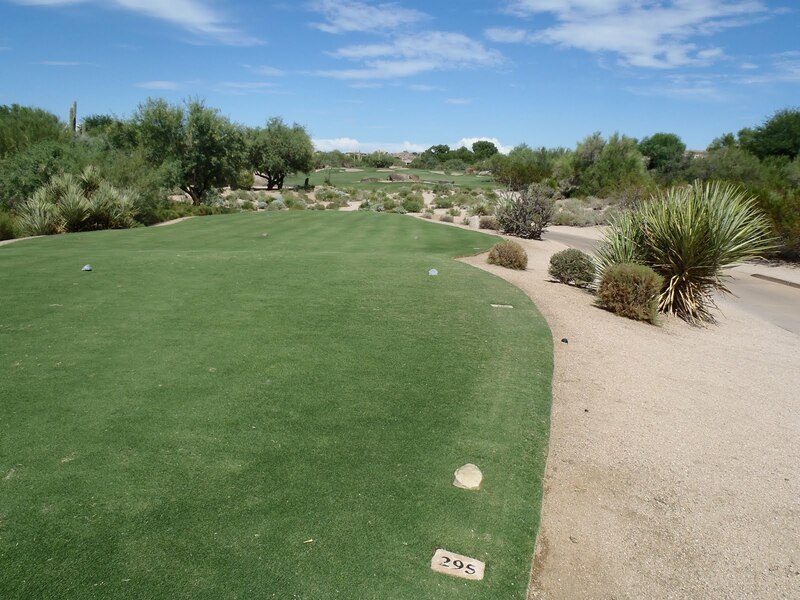 A detailed yardage card, an abundance of marked sprinkler heads and sheet in the cart detailing each green and pin position were all at my disposal, but today would be the day I lost 5 golf balls into the Scottsdale desert. At least I kept all my scores at 7 or lower, while Sean put up a 9 and an 8 to go with 2 birdies on his way to 92. What was immediately noticeable about the Monument Course was how excellently maintained it was. The fairways were green and healthy, to the point where almost all of Sean’s towering drives would plug. The greens rolled so smooth no putt was ever bounced off line and not once did I run into any deep ball marks or bare patches. The greenskeepers deserve loads of praise for keeping the course at a 5-star level even in the middle of a dry summer. The next thing I noticed was how quiet it was on the course. The layout is well routed and I don’t recall ever hearing another shot hit besides our own. With lush green fairways and big blue skies overhead and the feeling it was just you on the golf course, it truly felt like heaven. More than once I stepped back from my ball to just looked around and take it all in, and Sean agreed. It was great. 100 foot putt and chipping! 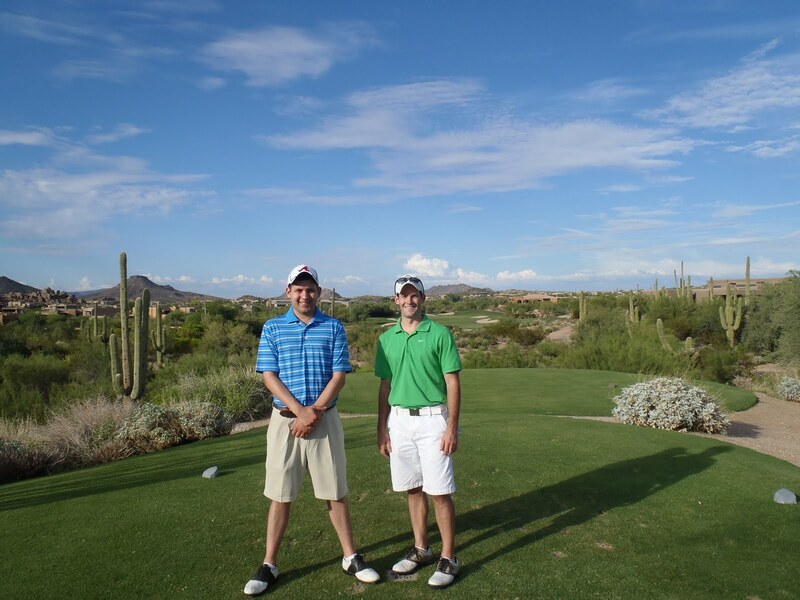 Going into our 2-day tour of both Troon North courses, Sean and I decided to play some match play for no money, amateur style, a 36-hole marathon match for bragging rights, the best reward of all. He opened with a 92 to my 94, but after the first 18 of back-and-forth golf in which no one had a lead of more than 2 holes at any one time, I was down 1 hole with 18 to go. Given my front nine it should have been much uglier. There were many things that could have made my day less than enjoyable. The loss of many good golf balls, two OB tee shots from sweaty grips and almost getting impaled in a sensitive area by a waist-high spear plant (scientific name unknown), but the course was too much fun to worry about my poor play. I would play here day after day after day if they’d let me. I completely understand why people were jealous when I said I was on vacation to play at Troon, because next time I hear someone say they are teeing it up here I will also be a little green with envy. This is only state 2 in my quest for 50, but I can only hope the rest of my experience matches this world-class course in the Arizona desert. This hole is appropriately named “Gamble”. 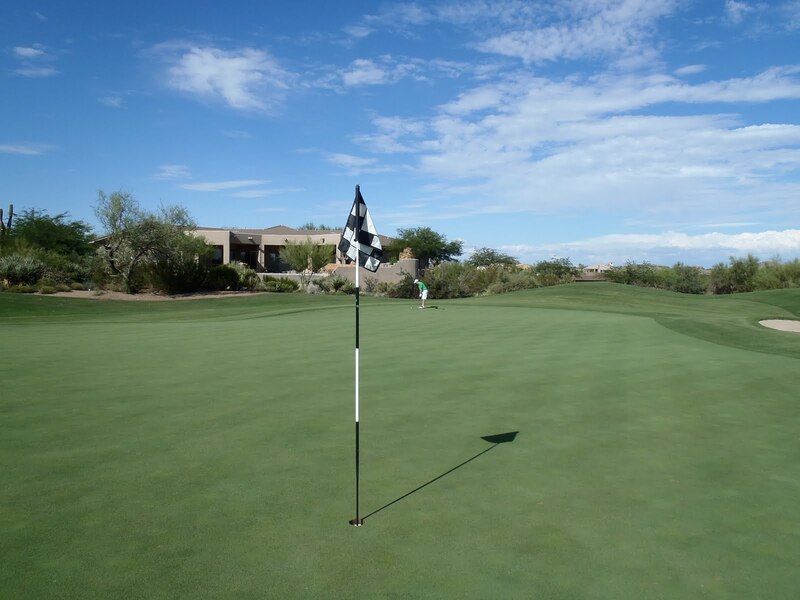 It plays just 295 from tee to green and once you clear the mid-range sand traps you can catch a favorable bounce on the downslope and ride it onto the putting surface. The gamble was in the 3 sand traps that lurked in front of the green and the narrow fairway that bottlenecked closer to the wide green. I hit my tee shot left of center over the front two sand traps, leaving myself a 55-yard flop over a sand trap to the tucked in pin that I two-putted for par. Sean, who had been crushing the ball all day, left his shot a short 5-yard chip from the green which he would get up and down for birdie. Nothing is more fun in golf than driving a par 4, and this hole made you weigh the risks. I leaned between 5-iron and driver until I figured I had to launch it just to see if I could. Luckily I didn’t hit any of the trouble that made the gamble risky. And there’s the big bunker waiting to swallow your long, straight tee shot. Amenities: 5; the pro shop is well stocked, the practice facilities are world class and the free yardage cards and divot tools are nice touches. 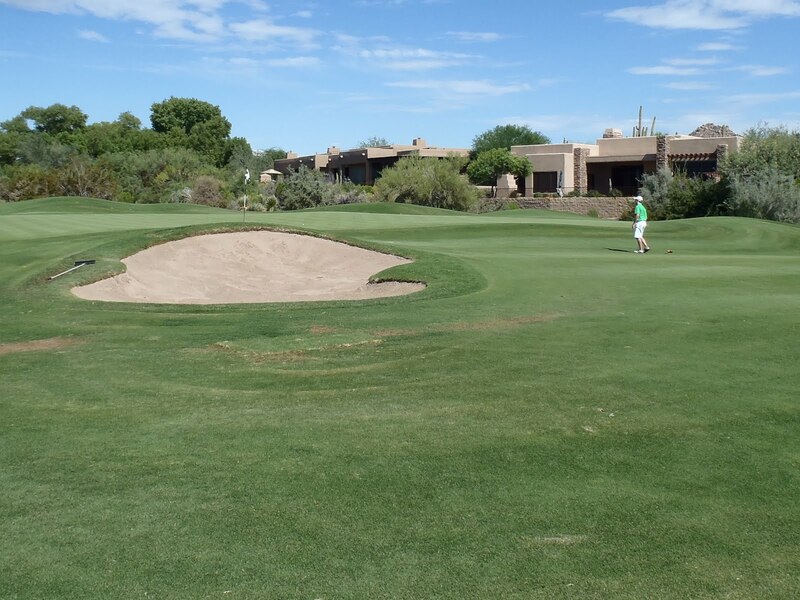 Difficulty: 4; the desert waits on both sides of the fairway, subtle breaks on the green make reading them tough and well-placed hazards are abundant, such as the giants monument boulder on #3. 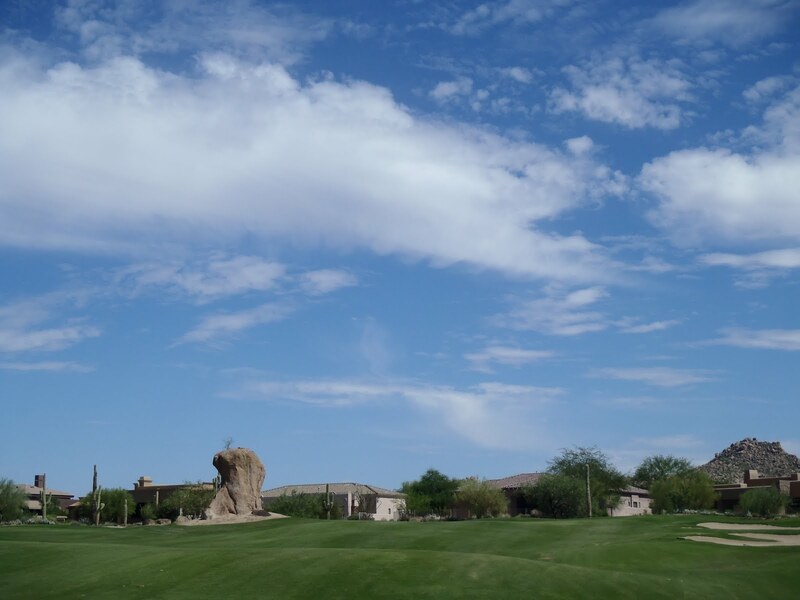 Scenery: 4; great views of the Phoenix area from the higher-elevated holes and some amazing luxury homes line the course to go along with numerous varieties of cactus and millions of rabbits. Value: 5; at $49 for 18, this is a bargain even if the temperature were 125 F. If you can handle the heat, play it in summer and save a few bones to have a course practically empty of other golfers. Overall: 4.5; if you can only play one course at Troon North, this is it.